I was going through some old prints of mine when I stumbled across these photos. I knew they were taken in Chaplin, Saskatchewan and fortunately I had scrawled the date (August 11, 2001) on the back of the prints. 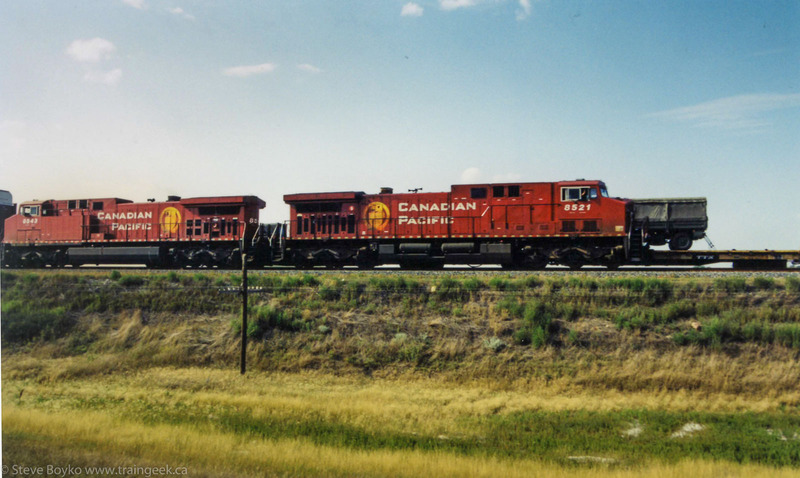 I recall we were returning from Moose Jaw when we spotted a military train heading west toward Chaplin. I grabbed the train coming into the town here. Nice wave from the conductor! Note the "dual flags" unit leading and the St. Lawrence and Hudson unit trailing. I don't know which country's military owned this equipment. I see it was marked for KFOR (the Kosovo peacekeeping force) but it doesn't look Canadian to me. I could be wrong. 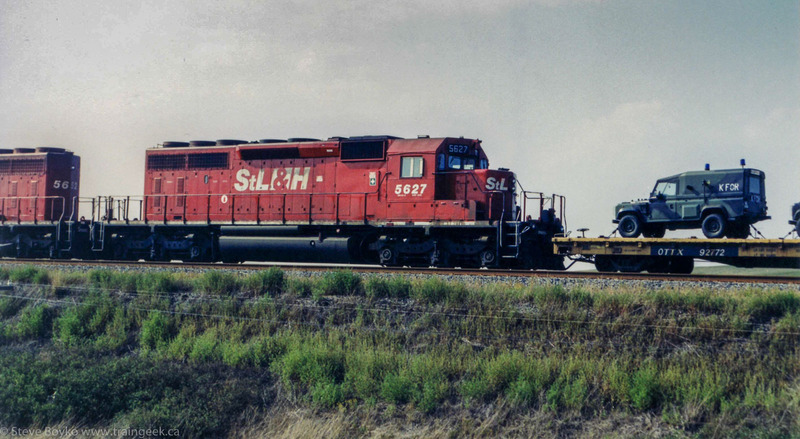 The majority of the equipment was on flatcars. A set of autoracks was on the rear of the train, presumably holding the smaller vehicles. 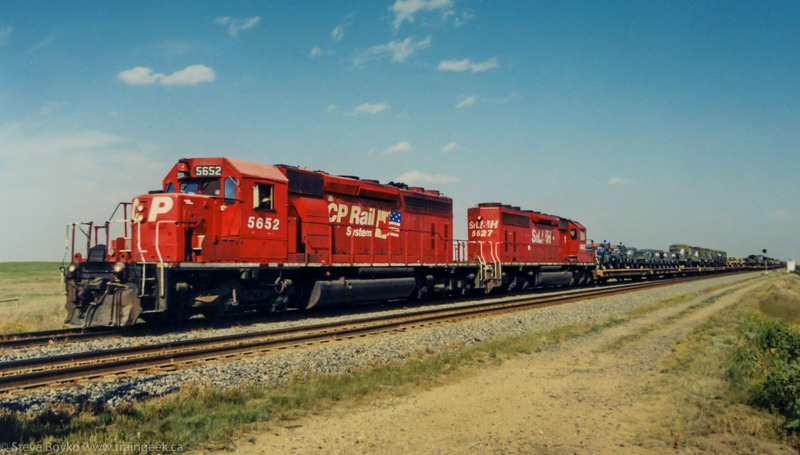 They took the siding when they passed me, to meet an eastbound freight train led by CP 8521 and CP 8543. Nice wave from the engineer of this train! 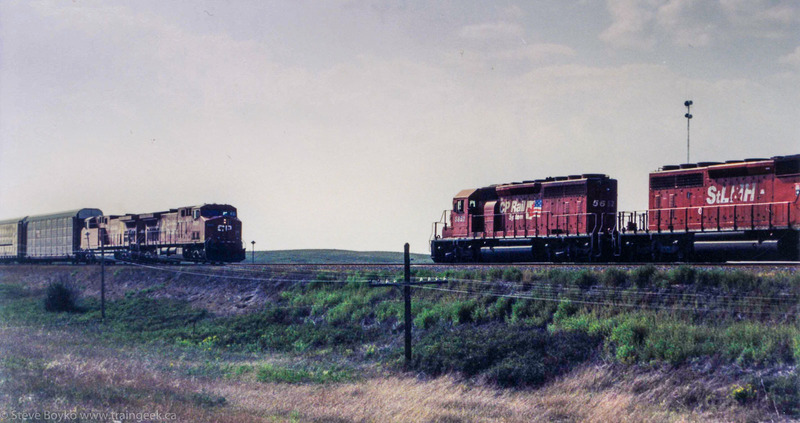 There were friendly train crews in Saskatchewan that day. PS I know the colours on some of these prints are a little "off". I fiddled with the white balance in Lightroom but I can't get them looking realistic so I elected to leave them as they were on the print. Lawrence, I should have known that. It's my middle name, after all. The armoured personel carriers are cool, but not as cool as the St.L&H -2! I did like the St. L&H unit, Karl! But as an army brat, the military equipment did interest me. 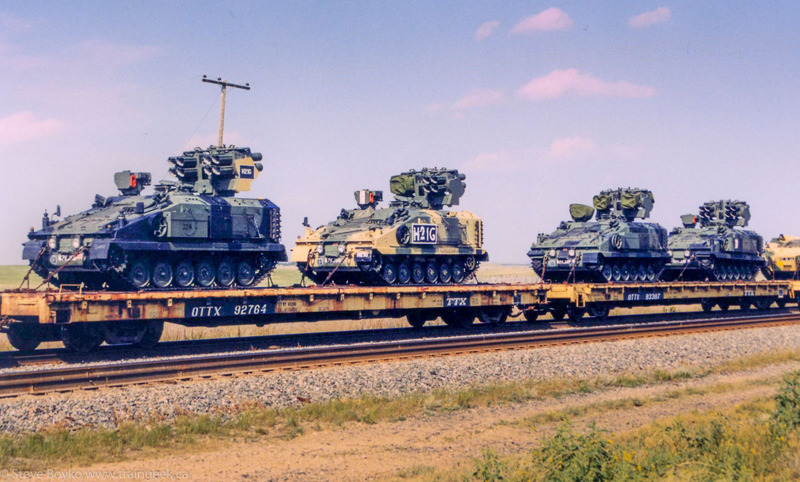 That would be British army equipment on the way to Fort Wainwright, AB for annual training exercises. AFAIK, those exercises have either been discontinued or they have equipment permanently stationed there now. Either way, those train moves are no more. CFB Suffeild NW of Medicine Hat, AB has a British Army Training Unit there. Perhaps they were going there? 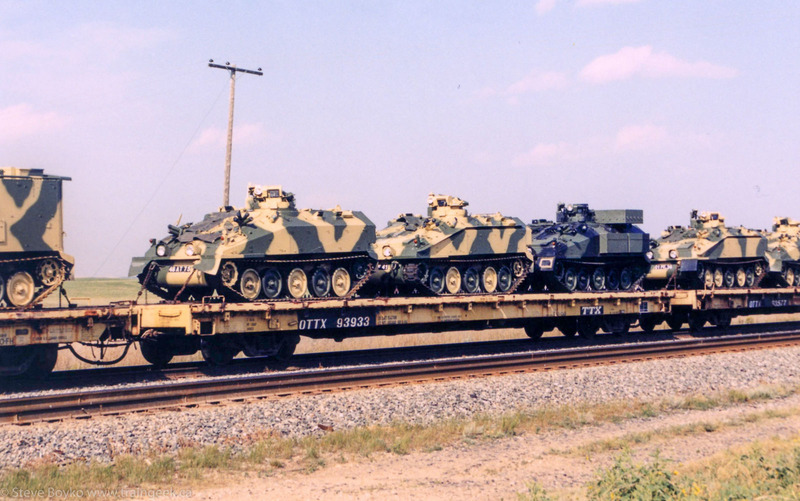 I have seen military trains there on occasion with them loading / unloading army equipment. They have a few exercises at that base each year.